I've been gone for about two weeks, did you notice? Well, I most certainly did. I finally got to go on that vacation I've been longing for. Just E. and me, with our car and little tent. 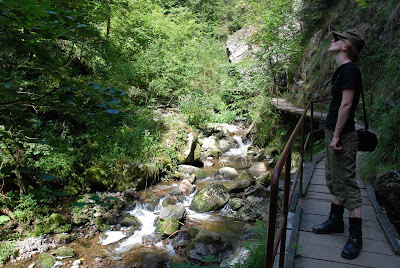 We went to Schwarzwald (Black Forest in Germany). We didn't book anything because we like to be free to come and go as we like and because the weather had been so unpredictable. We had great weather. Warm, but not too warm and only two serious showers on our last two days there. We came back yesterday and discovered that we had picked just about the only region with good weather within a day's driving distance from our home. 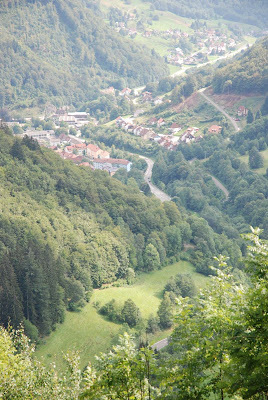 Schwarzwald is well-known for its natural beauty, and to a pair of flat-land-people like us, it's especially impressive. 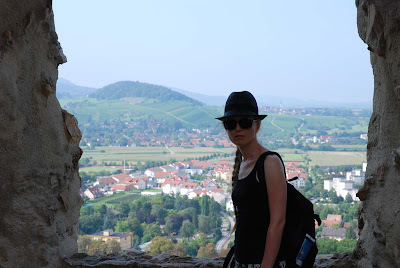 We've done a lot of hiking, taking in all the great views on the way and we've seen a few castle ruins and charming old towns. We've had a great time and now, I feel like I have to adept to being back home again. I haven't done anything sewing-related all that time and I've even worn less me-made clothes than usual... But I'm now well-rested and ready to go again! I've been working a lot this past week, I've made progress on E's jacket, written a possibly rather important letter and I've read a wonderful novel (I don't usually recommend non-sewing related books here, but I'll make an exception for this one), The Unicorn Road by Martin Davies. It's an historical novel about a voyage to China in the Middle Ages, but it's nothing like your average historical novel. I thought it was magical, despite the fact that I noticed some inaccuracies about the Chinese society at the time (like the absence of foot-binding). Normally, such thing put me off, but the writing here was just to good to be bothered by little things like historical fact. But, that's enough off-topic chatter. I thought I would show you some of my recent and a lot less recent creations in a different outfit. It's my re-fashioned silk blouse, tucked into my new shorts and topped with a linen jacket which I made before I even had this blog. I put this outfit together when I was playing around with my clothes, before I actually got dressed for the day. Unfortunately, it was cold and rainy outside so there was just no way I was going to walk out of the door with those bare legs. Last year, I wanted to make a short coat for my boyfriend. Casual, but based on a blazer block. I drafted the block and fitted and fitted and couldn't get it to work. In the end, I buckled and tried a less fitted casual coat block instead. With good result. 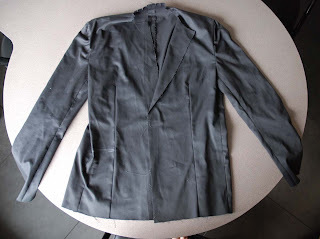 In spring, I revived the jacket project, this time with an unlined, casual jacket in mind. And failed again. This week, with the unreliable weather and remembering the experience I've gained in fitting my own new blazer block, I decided to try again. I simply started where I had left off (I had stopped cutting into the pattern at some, which was good, it would have been overly tight and useless had I made those last changes I had marked down) and this time around, I wasn't as puzzled with the issues. I'm now absolutely convinced that Grondvormen (= Basic shapes but the book has only been published in Dutch) was first published in the 80's and the jacket blocks haven't been changed to suit later fashions. Just like me when fitting my jacket, E in the jacket muslin looked OK at the front, just with way too wide shoulders but had endless pools of excess fabric at the back. I know now that it's best to deal ruthlessly with those issues. I did so and here on the table is the second version of the muslin. And I think I will work with this one. 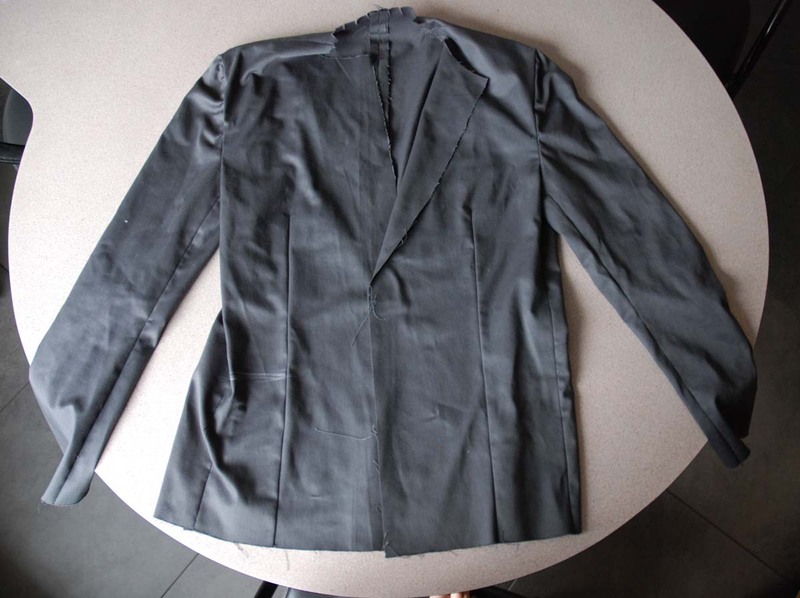 It won't 'fit like a glove' but I think a (man's) jacket needs ease.